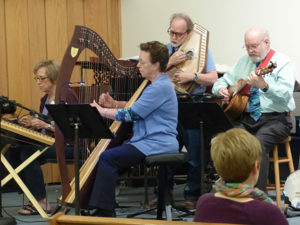 Peoples Strings group plays for the Sunday service. Our music ministry provides our Sunday services with a variety of musical experiences through a mix of outside musicians and members of the congregation. We explore many types of music as a way to illuminate our values and the spiritual side of life. The ministry strives to promote an inclusive musical culture within the church, add zest and inspiration to the church community, and nurture congregational talent by providing budding musicians and singers of all ages the support and encouragement of more experienced performers. Peoples Choir shares their talents on the third Sunday of each month from September through May. We practice at 7pm on Wednesday nights, and are always happy to welcome new members. Plus, we're a great way to get to know other musical folks at the church. Contact us to learn more about the choir, or just show up at practice! Musicians from within and beyond the congregation help enhance our Sunday services by playing typically three pieces of music for the prelude, postlude, and offering. We appreciate having musicians in the community dedicate Time and Talent to making our services enjoyable and meaningful. Solos, duets, and bands are all welcome. Contact us to learn more about playing during the Sunday service.